If you read my last post, you know that I recently made the decision to move back to Durham, North Carolina to attend Duke Divinity School. I know I didn’t get in because of good grades, so I’m basing the acceptance off of my recommendation letters and my essay. I want to give you my essay, because it explains much of the reasons I decided to apply in the first place. I also feel like when you have to write an admissions essay, it’s hard to know where to start or how to structure it. Hopefully this example will help you if you’re considering writing an essay or application of some sort. One last note: I do not want to boast or brag, but I ended up getting a full ride to Duke. I’m pretty sure this essay was at least 50% of the deciding factor. At first, she refused to receive me in her hospital room, which was common. Most medical professionals entering the rooms of patients were there to poke and prod, examining the vitals, taking blood pressure, and administering medicine. For the patients who were terminally ill like mine, the time between these invasive procedures was preferred to be spent in peace reflecting back on their lives, lying in a depressive state, or getting ready to pass on. I asked her, “What would help you pass the time here? I’m your music therapist. Would you like some music?” She rattled off a list of all the old hymns she used to sing, the songs she and her husband would dance to, and songs she used to sing to her children. She suddenly sat up, as if a burst of energy coursed through her veins, and said, “I am pretty sure I will die today. I’m waiting for my family to get here. I want to write a song for them for my funeral.” I got out a blank sheet of paper and my guitar and we started writing her last song. My dream was to start a successful music therapy practice and help those considered “the least of these.” When I moved to Durham, North Carolina in 2005, I created a music therapy practice serving clients with developmental disabilities. The dream was going well in reality, and I was presenting regularly at national conferences and published in academic journals. I had been attending a Korean Presbyterian USA church, volunteering as the worship leader. I started making connections between worship practices and spiritual formation, greatly aided by the work of Marva Dawn in “Reaching Out Without Dumbing Down: A Theology of Worship for An Urgent Time.” Up until reading this book, I had not made links between the transformative power of music that I was practicing in music therapy and the transformative power of worship through music and the arts in Christian community. This book allowed me to delve deep into worship practices and liturgy, and I found myself wanting to understand worship more fully. I reached a burnout point in music therapy when I became pregnant with my first child five years later. I was physically and mentally tired after not having a proper break in self-care, and it was time to reevaluate my calling. A wilderness period settled in as I explored the unfamiliar terrain of being a new mother, and I turned to holy reflection and guidance for my future. In the midst of this wilderness, I received a phone call from my friend Chris Rice asking me to lead worship at the annual Summer Institute at the Duke Divinity School Center for Reconciliation. I had a diverse group of friends that were musically talented, so we formed a makeshift band and stumbled our way through the conference. I thought it wise to read Chris and Emmanuel Katongole’s book, “Reconciling All Things,” and tried to somehow fuse the ideas of reconciliation to worship and liturgical practices. We did not quite know what we were doing, but by the end of the week, the conference organizers, directors, and our band knew that our work had ignited a certain kind of momentum. What would it look like to consider worship and liturgy as a necessary component in reconciliation? Had we underestimated the role of liturgical art and music as necessary to this work? Why was there such a gap in songs of lament? What does reconciliation sound like? Following the Summer Institute, our makeshift band, now officially called Menders (a reference to “repairers of the breach” in Isaiah 58:12), received requests to lead worship at various conferences, retreats, and churches. These organizations not only liked our “look,” as we were multicultural and diverse, but they respected the depth of our liturgical practice of leading worship. People knew that we could articulate what we did in worship that went beyond just a multicultural presentation. At the same time, I made connections with other leaders around the nation who shared similar vision. I began getting offers to be a part of worship teams of larger national conferences, such as The Justice Conference, The Christian Community Development Association, and Missio-Alliance. This time was gifted to me by God, I feel, to develop my theology, experiment with different people groups of believers around the world, and gain experience on the national platform. I was a guest lecturer in Dr. Lester Ruth’s contemporary worship class at the Divinity school, and I started speaking and giving workshops in multicultural worship and reconciliation. I helped numerous pastors craft job descriptions for multicultural worship leaders. I was finding that I had a voice that was useful and even necessary for ministry, and there were others that were eager to learn from me. In the summer of 2012, some friends told us about a former Young Life co-worker who was interested in planting a multiethnic church in the United Methodist tradition in Durham. At the time, I had grown weary of this sort of pastor – a white male who wanted to change the city and plant a multicultural church that would change the world. There were so many other pastors with the same dream with no idea how to implement such a plan, costing people of color their time, energy, and hopes. We cautiously helped plant CityWell, knowing that the journey would be long and arduous. It was, indeed, very messy. This “experimental church” project had now become a sobering reality for all of us, and we made numerous missteps along the way. It was a spiritual endeavor, one with long hours, trying conversations, and a falling out of many of the idealistic people among us. What remained was a steady core of diverse voices along the lines of gender, sexuality, race, class, and ability that walked together in deep, sacrificial ways to build a strange and tight-knit community. I was hired as the first music minister of the church, and this job allowed me to finally put my ideas, theology, and musical worship leading skills in the context of the real church, one with a reality of a weekly deadline and fewer resources. Our family uprooted to Chicago two years ago when my husband accepted a job offer he couldn’t refuse. I interviewed at several churches around town, praying for direction in how to spend my time in the city. Then one day, I received an e-mail offer from Willow Creek Community Church’s Chicago location. A large white evangelical mega-church had been the last sort of job on my mind, but strangely enough, I felt drawn to this particular position. The role was that of “Program Lead/Creative Director,” and from the job description, I gathered that this was the mega-church’s term for a liturgist, which peaked my interest. What if my ideas of worship and reconciliation extended to the entire service, instead of just focusing on the music? What possibilities there could be! I accepted the job offer, and began the job with a peculiar interest in what God had in store for me. The wonderful, fascinating world of Willow Chicago has taught me so much. My specific job was considered less a liturgist and more of a producer to create a Christian experience in an urban church setting. The music team is comprised of professional, paid musicians, and vocalists who had been on TV. This was a far cry from my ragtag worship team that made an authentic joyful noise at CityWell. I was expected to strive to produce art in the form of films, scripts, drama, lighting, and dance at a very high quality, sometimes hiring outside professionals instead of congregants to volunteer. Recently, God has been speaking revelations about this calling to me. Much has been criticized about the white evangelical church as a political voting bloc and as a judgmental people group, and here I was, developing content in a subversive way that would hopefully bring opportunities for deeper discipleship in our one Lord Jesus. God has shown me that I could be a person of influence, and that this job would play an important role in shaping me into a well-rounded theologian and practitioner. Throughout this essay I have failed to mention the ways in which my experiences have alerted me to significant lacks in the church. The lack of voices, worship music, resources, materials from people who looked like me. The lack of understanding of the intersections of my culture, heritage, and race through a theological lens. The lack of respect from leaders and pastors who would look down on me because I’m a short, Asian woman. The lack of mentors readily available and accessible who could help me on this journey. I have worked very hard to find Asian-American women who could serve as mentors and conversation partners. Reading the works of my now mentor and friend Dr. Grace Ji-Sun Kim, especially “Embracing the Other,” and “Making Paper Cranes” by another Korean-American theologian, Mihee Kim-Kort, has assured me that I too belonged in this world. Whenever I envision the Church of the future, I ask myself the question, “What kind of world would I wish for my children’s children many years from now?” My mind fills with dreams of my grandchildren being transformed by a loving and just Jesus and being spiritually formed by worship music, books, pastors, and mentors that range the vastness and richness of the Kingdom of God, including people that look like them. That their work and offerings would not be shriveled by their culture, background, or lack of mentors. That they would view themselves as tremendous, needed gifts belonging to the Church, and that their minds would be filled with wild and prophetic dreams. I realize that my life thus far, from my days as a music therapist up until my current reality at a megachurch, has led to the calling of making these prophetic dreams come true. Duke Divinity School has been a very integral part of my spiritual formation as a worship leader, speaker, and writer. 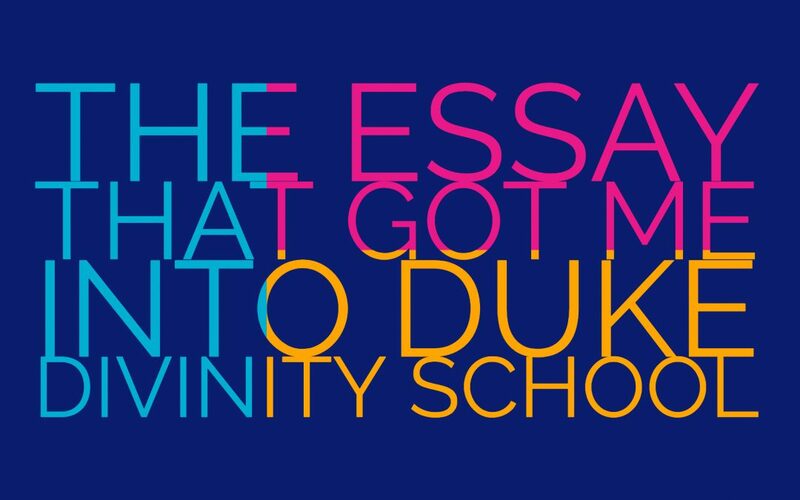 Over the eleven years I lived in Durham, I benefited from the many events and guest speakers that Duke has hosted. I have come to know and learn from professors, pastors, leaders, and musicians in the area. I desire to dive deeper into my theological understanding to guide my work. I also feel that I can contribute to the ongoing mission and work of DDS to benefit others the same way that it has benefited me.